A prototype absinthe, based upon the award-winning Duplais formula, has just become available on the Absinthe Distribution list. A "prototype" is another word for "experimental", where they let you try out some of the early batches of a new kind of absinthe. And this one is only 120 proof! 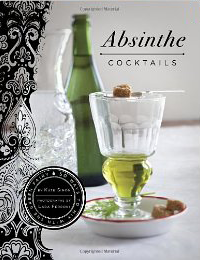 Foreign Correspondent reporter Jane Hutcheon's story on absinthe is a resounding success. Very well done, with a great discussion of making absinthe with Ted Breaux, who seems to be everywhere in the absinthe world these days. We particularly loved the visit to the Combier Distillery, where Breaux works his magic on the Jade Liquors line, as well as the Combier Blanchette. 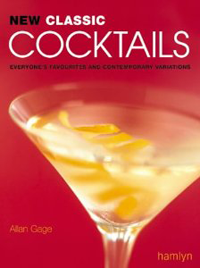 Be sure also to check out the informative PDF article by Ian Hutton, one of the owners of the Liqueurs de France site, a recommended vendor of absinthe. 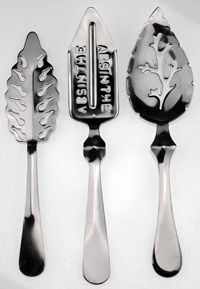 The ingredient that keeps absinthe off US shelves is dissected in a wonderful new article by Ari of the Wormwood Society. Thujone, claimed to have a similar structure to the hallucinogenic compound found in marijuana, is limited to 10mg in Europe and is why absinthe importation is not allowed by the FDA here in the US. Recent research has called into question the scientific basis for its exclusion, and this article does a good job of summarizing current thought. James K. Polk was actually an absinthe drinker who once drunkenly declared statehood for his own sideburns?? In case you don't remember, Ken Jennings is the world champion Jeopardy player, who 74 games in a row and $2.52 million on the show. So I'd guess he's probably not just making it up! And yes, his blog is a lot of fun to read.